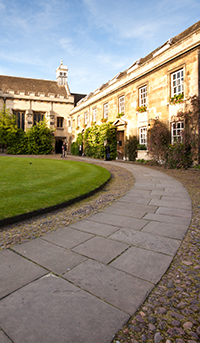 A gift in your Will to Christ's College may reduce the amount of tax payable from your estate. This varies from country to country, so please seek advice from your solicitor, attorney or financial advisor. Estate gifts to Christ's should be made with reference to the College in its full official title and include the College's Registered Charity Number (1137540). Your attorney can provide advice on including an estate gift to Christ's. For our U.S. alumni, a planned gift can offer significant tax benefits; substantially reducing capital gains and estate taxes or providing immediate income to you or your beneficiary. U.S. tax payers wishing to support Christ's through an estate plan may do so via Cambridge in America (CAm), a nonprofit 501(c)(3) organisation based in the US. You can include a bequest to Christ's at the time of making your Will, or add a codicil to amend your existing Will. We suggest you seek an opinion from your own legal counsel before making a decision which will significantly impact tax liability. An outright bequest to Christ's through Cambridge in America is deductible for federal estate tax purposes, with no limit on the amount of charitable tax deduction your estate can take. In addition, bequests generally are not subject to state inheritance or estate taxes. This may vary from state to state, so please seek legal counsel when preparing your estate plans. In a large estate, the savings could be more than half the value of the bequest. "I BEQUEATH TO CAMBRIDGE IN AMERICA, a 501(c)(3) nonprofit corporation organized and existing under the laws of the District of Columbia with the business address of 292 Madison Avenue, 8th Floor, New York, NY 10017, the residue/a proportion of the residue of my estate/the sum of $ (amount in dollars), to be used exclusively for its charitable purposes. It is my hope that these funds will be utilized for the support of Christ's College, Cambridge (Registered Charity Number 1137540) for (area desired for support/the Master, Fellows and Scholars to apply in such a manner as they think fit for the benefit of the College)." Retirement plans that remain in your estate are often subject to both estate and income taxes when received by your heirs. Using your retirement assets as a gift vehicle can be a tax-efficient way to make up all or part of your bequest. By naming Cambridge in America as the beneficiary of all or part of your plan, you can limit this potential double taxation and leave a bequest for Christ's. Making Cambridge in America the beneficiary of all or part of your existing life insurance policy for the benefit of Christ's may entitle you to an immediate tax deduction, and any future premium payments may also be tax deductible. A life income gift can benefit both you and Christ's. Through Cambridge in America, you can place your assets into a Charitable Remainder Trust and receive regular distributions from the trust, with CAm receiving the assets at the end of the trust term. A CRT is an excellent way to fulfill your desire to support Christ's while supplementing your current income, receiving a tax deduction and reducing the taxes levied on your estate. In addition to membership to the Christ's Fisher Society, legators are invited to join Cambridge in America's 1209 Society, which also honours the many generous donors living in the U.S. who have chosen to support Cambridge through planned giving.